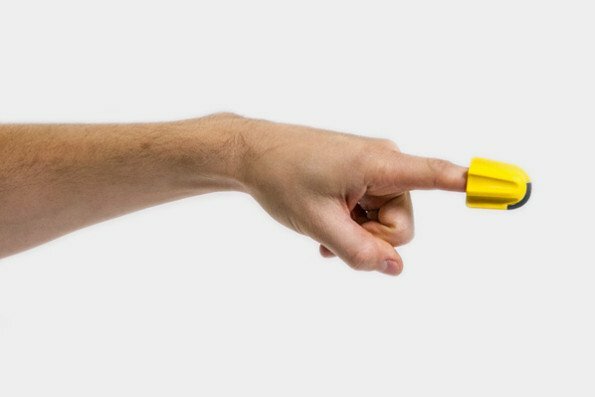 Nimble – cutting power at your finger tip. I have here the smallest product that I have ever tested and reviewed, but it’s probably one of the most useful little gadgets that I have ever seen. In fact the blade is a tiny ultra-hard zirconia ceramic blade that barely protrudes, its so small that they claim that if you did try to cut yourself, it would barely match a cat scratch, yep I tried and it was a tiny scratch. The Nimble is a one size fits all, I have big fingers and my wife has very small fingers and it was comfortable for both of us. Simon from Version22 threw in a couple of small bags of Haribo in with the Nimble and so the first thing that I used the Nimble on was the Haribo, I held the bag in my left hand and with the Nimble on the index finger of my right hand, I ran it across the bag and with hardly any force, the bag was open and the contents consumed. So like any man with a gadget that can cut, I set about slicing everything I could find. My daughter had a new buggy for her toddler delivered today and she grabbed the Nimble and in a flash she had cut through the thick packaging tape, what’s also great is that you don’t have to stress about damaging the goods inside the parcel. When I was able to work, I was a nightmare with losing tools and I would put something down and that’s it, it was gone. This little gadget would be a God send to anyone working in a warehouse opening packages all day, the Nimble could sit on your finger and you don’t have to put it down, you can still lift boxes and packets and lift your cup of tea. However I think that this is a life saver for people who have reduced mobility in their hands, I have stiff painful hands and at times like Christmas when I’m cutting wrapping paper, its very uncomfortable, the Nimble would would easily glide through wrapping paper and sticky tape. 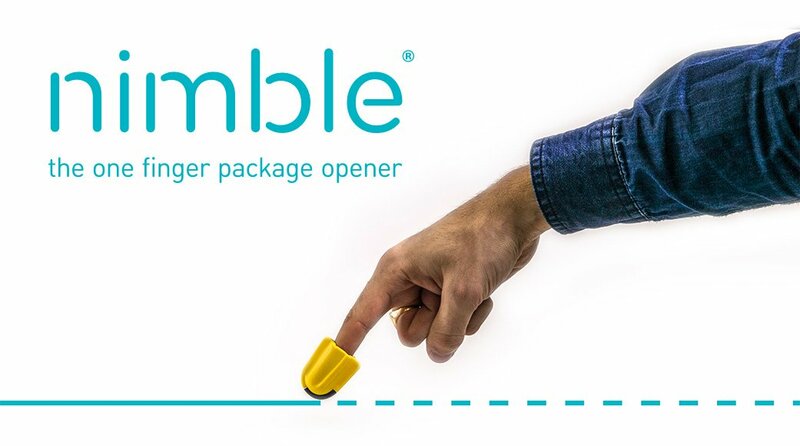 Imagine if you couldn’t use scissors, Nimble would enable you to open envelopes, packets, parcels and all those fiddly packets that all goods come in nowadays although at the moment it isn’t able to cut open those very thick clamshell packets, but it’s okay on the thinner ones. Nimble also reduces the risk of injury like when using scissors or knives and you can cut safely knowing that it’s not going to go through your carpet or trousers etc. What is also very appealing is the price, its £8.99 from http://version22.com/shop/ and whilst you’re there, check out the colourful storage gadget called ‘Geco Hub’. This is one of those gadgets that you look at and think “damn why didn’t I think of that”, if are familiar with the film Cocktail, its like the Flugelbinder that they discuss in the film. Well done to the people at Version22, this is a gadget that will be of great use to a people in a multitude of scenarios and it will also help disabled people to safely cut. Congratulations on finding your Flugelbinder! ← A reminder of school days!